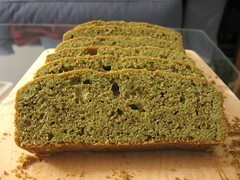 Green Tea Pound Cake - Do You Know The Muffin Man? Notes: I think there's a misprint in the book: the yield is supposed to be two 9×5×3" cakes, but as you can see, the loaves came out very short. The Classic Pound Cake recipe a few pages back uses the same amount of flour, butter and eggs and makes one loaf. I sent Nick a question on his website and will report back here. The batter seemed quite dry until folding in the whites. Although matcha isn't a flavour I particularly like, this cake was good, buttery and light, with a very fine crumb due to the confectioner's sugar, and a slight crunchiness on the edges from the egg whites. Update: I've confirmed with Mr. Malgieri that this is indeed a misprint. The yield is one loaf.